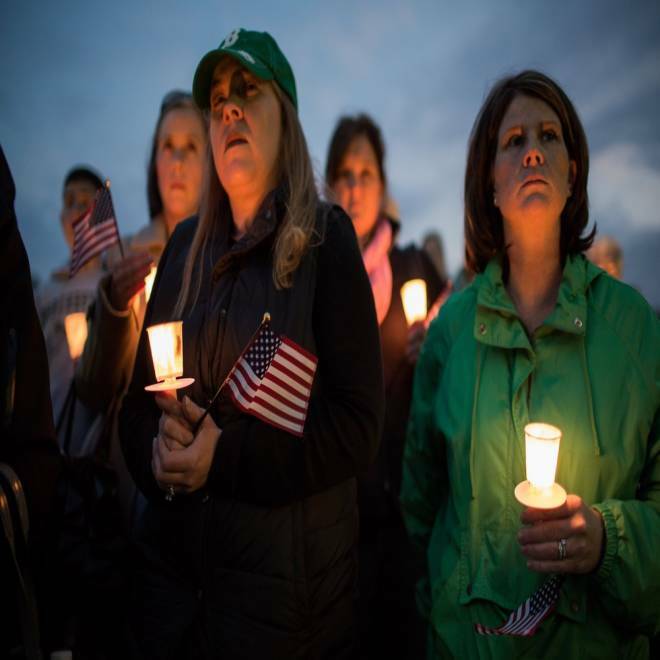 Lisa Robinson, Kimmarie Keane, Kim Daly and Shiovan Ross, left to right, take part in a vigil on Tuesday, April 16, 2013, in Dorchester, Mass., for the family of 8-year-old Martin Richard, who was killed in the Boston Marathon bombing. The women went to high school with Martin's mother, Denise Richard, who was also injured in the blast. 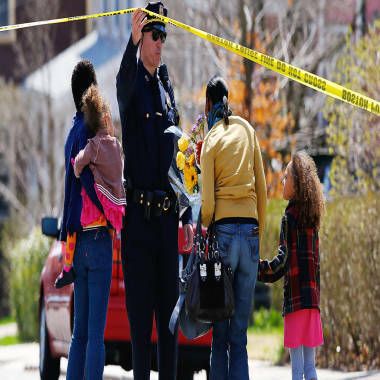 Three died in the bomb blasts at the Boston Marathon including 8-year-old Martin Richard, the youngest victim, who was remembered by neighbors who left flowers and candles at his family's home. NBC's Katy Tur reports. Martin Richard, 8, was standing by the finish line with his family Monday afternoon when an explosion tore through the area, killing him and two others, and injuring 176. Richard's mother, Denise, suffered a brain injury and his 6-year-old sister, Jane, reportedly lost a leg. His father, Bill, has asked well-wishers to keep the family in their prayers. “We are saddened and shattered by the fact that he will no longer run, and smile, and jump, and play, and live, and love among us,” he said. Her son James, 7, and daughter, Madelyn, 5, played street hockey with Martin last year, though Murphy said they didn't really know the Richard family. But James recognized Martin's photo on news reports and asked why he was in them, leading to a sad conversation. This undated photo provided by Bill Richard, shows his son, Martin Richard, in Boston. Friends and neighbors in the Richard's middle-class neighborhood said earlier in the day that they were stunned by the loss. The Richards were a “typical, all-American, lovely family,” neighbor Margaret Admirand said, choking back tears. Neighbors said Bill and Denise are very active in neighborhood groups, and the children were sporty, playing basketball, hockey and soccer. Another neighbor, Beth Nagy, 48, said the daughter, Jane, had won a medal at a kid's running event on Saturday that she was so excited about. Some of Denise Richard's high school friends from Mount Saint Joseph Academy joined the vigil, and recalled that in school she was soft-spoken, always smiling, pals with everyone and intelligent. They hadn't seen her recently but had been in touch as they organized their 25th high school reunion to take place in October. 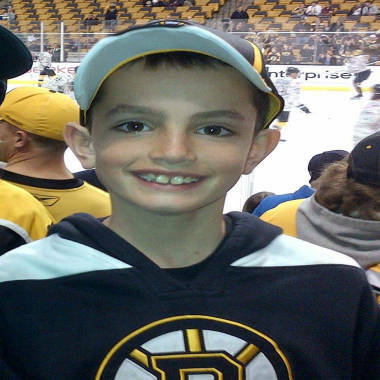 Martin Richard, the young victim of the Boston Marathon bombing, is described by his neighbor, Jane Sherman. 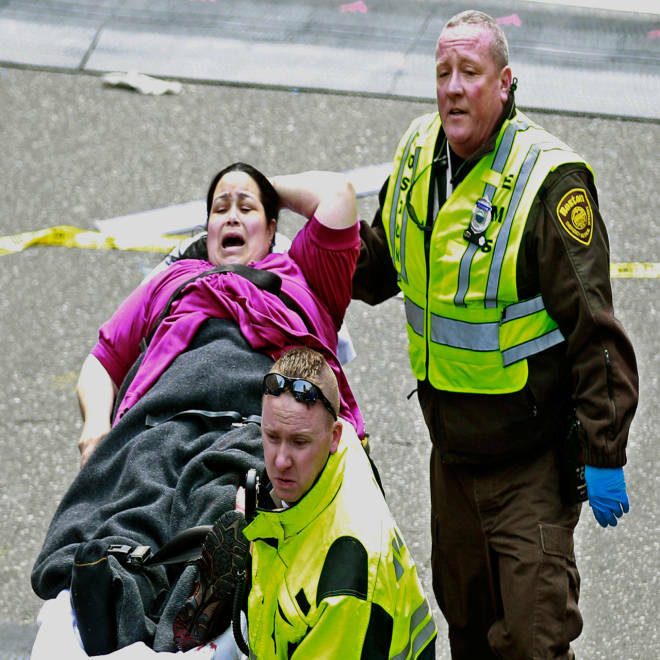 Earlier Tuesday, Rep. Stephen Lynch of Massachusetts described what happened at the marathon after speaking to the dad. Friend of the family James Keefe told the Dorchester Reporter he was near the finish line when the blasts went off. The boy’s father was on a neighborhood committee to refurbish the Ashmont T station, said friend Kevin Skinner. He serves on the board of directors of St. Mark’s Area Main Street, according to the community organization’s website. Friends of the family gathered at Tavolo restaurant on Monday night in Dorchester. Denise Richard is a school librarian at the local Neighborhood House Charter School, where Martin attended as well as his sister Jane. The flag at the school flew at half-mast on Tuesday. A Boston Police officer lifts the tape for a family to leave flowers in front of the home of the Richard family. Denise Richard is on the executive board of the Ashmont Adams Neighborhood Association, according to the organization’s website. She bakes goodies for school events, and is always “proud as a peacock” to walk around the neighborhood with her kids in tow, her neighbor Admirand said.